Congratulations to the University of Michigan’s Housing Facilities Department for winning the Silver Green Cleaning Award in the higher education category! 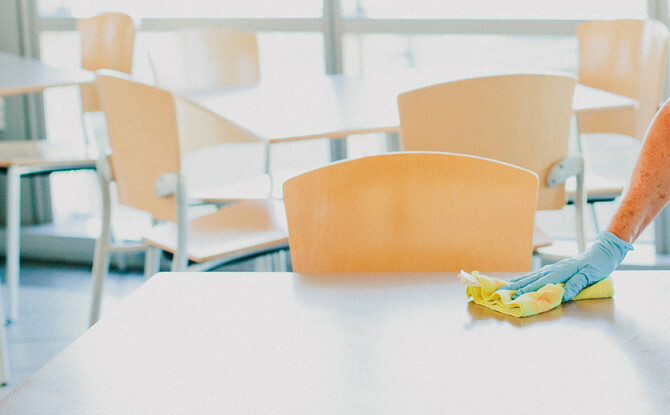 Located in Ann Arbor, Mich., this university has 12,000 residents all of whom are living in healthy, clean and green dorm rooms thanks to the innovative green cleaning program in the housing facilities department there. Recent green cleaning initiatives include a switch to engineered water, a pilot residence hall composting program, a campaign to engage cleaning staff with student awareness and a comprehensive plan to protect indoor air quality. A cornerstone of the department’s green cleaning program is its use of engineered water as its primary cleaning agent throughout all the campus’s residence halls. Changing from traditional cleaning chemicals to engineered water was an intensive process. It took time to conduct the proper before and after testing, comparing results with other cleaning agents and then providing comprehensive training for all staff to overcome any confusion or reluctance to change. But according to Vicky Hueter, Director of Housing Facilities Operations at University of Michigan, it was worth it. Not only are they one of the first university departments in the state to be using the particular technology they have chosen, but also the environmental benefits are great. “Now we know nothing bad is going into the city sewers except for water and dirt, because the product has a two-hour half life,” says Hueter. That’s not to mention that her department now saves about $50,000 a year on cleaning agents. There is still a need for traditional restorative chemicals in the dorms. For example, some residence halls have bathrooms attached directly to the dorm rooms. It is up to the students themselves to clean those showers and toilets while they are living there. Needless to say, when students leave campus for the summer, Hueter’s team often has a buildup in these restrooms to deal with, and in those cases a stronger cleaning agent than engineered water may be needed. In fact, indoor air quality is a really big for the folks in the housing facilities department at the University of Michigan. All equipment used by the department has to meet very high flitration standards. Backpack vacuums with six different levels of filtration reduce the release of toxins and irritants back into the environment. The department uses no aerosols and the lowest pH products available only whenever necessary. The success of composting programs like this depend on awareness of the building inhabitants. In that matter, the University of Michigan’s Housing Facilities department is well ahead of the game. They already have a campus-wide poster campaign that features pictures of cleaning staff and a personal statement from that staff member. Seeing cleaning staff recognized in this campaign helps motivate students and residents to understand the green cleaning program and its significance and it has been invaluable for staff morale and the important relationship between staff and building inhabitants that a truly successful green cleaning program depends upon. This department is always innovating and looking to the future, whether that be around ways to build stronger relationships with students or ways to reduce waste. They have recently implemented special move-in and move-out day recycling programs that add styrofoam recycling and increase the amount of cardboard that is recycled. They’ve also provided easy ways for students to donate clothing, bedding, carpeting, household items and even unopened food on move-out days to eliminate those items being tossed into the trash. So many old dorm mattresses go into the landfill after being used in university housing for a certain amount of years. At the University of Michigan, they are now looking into outside organizations that can repurpose these mattresses, in addition to donating mattresses to local homeless shelters. Presented by Healthy Schools Campaign, American School & University magazine and the Green Cleaning Network, it highlights schools with innovative, health-focused and environmentally minded cleaning programs. Judging criteria are based on our 5 Steps to Green Cleaning in Schools. Applications for the next round of awards will be available soon. Sign up for our newsletter to be notified when the application is posted. For more information check out the American School & University website. We look forward to learning about your green cleaning program!